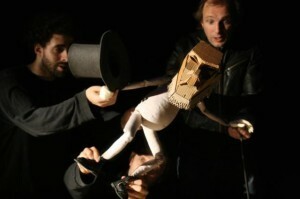 Award-winning bunraku puppet show The Table returns to the Soho Theatre this month. Bunraku, for those without a degree in theatre studies, is a form of Japanese theatre that makes use of visible puppeteers. Recent examples include Avenue Q, the opener for last year’s LIMF and the Complicite/Blind Summit collaborations A Dog’s Heart and Shun-Kin. We reviewed it during its last run and were amazed by how well the main character Moses was brought to life. A cardboard creation powered by three members of Blind Summit, Moses is physically confined to his table but is more than happy to share his views on life with the audience. Now that he is back in London, we spoke to Moses about Soho, the Olympics and what he thinks of Boris and Ken. The Table continues at the Soho Theatre until 26 May. More information can be found here. If you want to learn about how to be a bunraku puppeteer, there is a course this Friday run by Blind Summit and War Horse puppeteer Henry Maynard.